Happy Father's Day to whoever's celebrating! Hubby is a very happy dad today cos he got some homemade pot roast. Men just love pot roast. Well, what's not to love? Nicely browned and braised hunk of beef, swimming in flavoursome gravy. This is my first time making pot roast, actually. I don't have a recipe mainly because I winged it. Basically spent 20 minutes browning the meat (which I'd rubbed salt and pepper on while waiting for the olive oil to heat up) and then some chopped onions and carrots, before tossing everything together to simmer slowly in chicken stock with bay leaves, bits of thyme and a splash of sherry (port is even better if you have it). It was pretty much ready 99 minutes on my induction cooker, but I let it cook for a further 30 minutes (and the onions turned to mush - hey, instant thickener!). Hope you all had something nice to eat today! 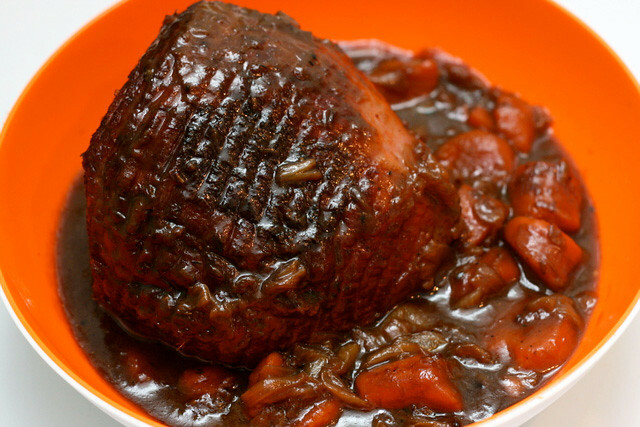 Very good looking pot roast! Glad you had a good father's day! that looks like a big pot of food! haha how many of u shared that? or did ur hubby finish everything? Hello! Can you pls let me know where you got your pot roast from? 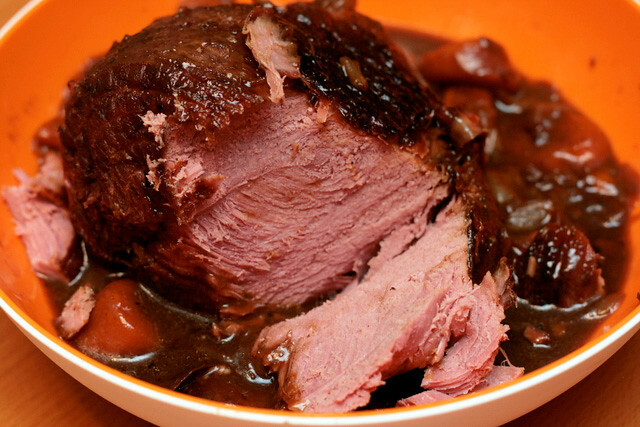 I have a pot roast recipe which I'm dying to try out but as I just came back from overseas, am not too sure where I can get a good piece of pot roast. Thanks! Thanks everyone! Anonymous, I got the meat from Cold Storage. Should be readily available. Good luck! Thanks for posting this recipe. It sounds amazing! Pot Roast and a hearty side dish is my favorite type of meal. When making pot roasts for dinner, I would recommend trying grass fed Black Angus beef. It is absolutely delicious and a healthier option. I work with La Cense Beef and because our beef is 100% grass fed it is higher in omega 3 acids and lower in calorie and fat as opposed to traditional grain fed beef. Try grass fed Black Angus Beef and you will be able to taste an even bigger difference! It makes you lick your fingers after eating. I will definitely try to cook it.